I've been busy lately, taking time out after that Darwin blog-a-thon. I've been working on my Wasmann paper for the symposium this weekend, reading Desmond and Moore's Darwin's Sacred Cause, making arrangements to attend the big SSB/SSE/ASN conference this summer, and basically trying (successfully) to keep the blog from running my life. Are you tired of hearing about Darwin by now? I am too, so let's talk about what happened after Darwin. On February 27-28 (just two weeks from now), the Bryan Institute for Critical Thought and Practice is sponsoring a seminar entitled War and Peace: 150 Years of Christian Encounters with Darwin. 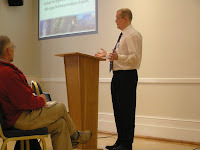 The purpose of the seminar is to take a look at the ways various Christians have reacted to evolution in the past. This is not any kind of creationist conference. In fact, I'm the token creationist speaking, and I'm not even speaking about creationism. Instead, the purpose of this conference is to look into the history of Christians who reject and accept evolution (and one who did both). Hopefully, we might just learn something. OK, technically I'm not actually reading this book and probably never will read it all the way through. But it's a neat book anyway, I wanted to tell you about it. It's a coffee table book that contains 27 reproductions of Darwin artifacts. 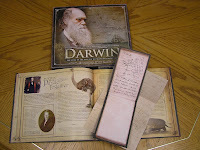 Here's the slipcover and book, together with a copy of the B notebook page with Darwin's first tree diagram and facsimile pages from the Sketch of 1842, the first complete outline of his species theory. This is a reproduction of a famous passage from Darwin's diary, where he explains how he came up with the idea of the evolution of species. Here's the original at Darwin Online, complete with transcription. Each item also has the manuscript catalogue number, so it's easy to track down information on the original. A funny thing about collectors: We tend to get really excited over really weird things. I'm not talking about casual collectors, the kind that pick up a collectible spoon or keychain when on vacation. I'm talking about diehard collectors, obsessive, completist whackos who would gladly give up food or electricity for a month or two if only they could acquire that last item for their collection. If you've ever said something like, "You spent how much??? On that thing?!" then you probably know one of these collectors. Way back when I started this blog, I decided not to write ponderously long entries, since I always hate those on other blogs and never read them. I'm making an exception for this, and I hope it's worth your time. 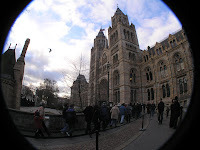 About a year ago, when we planned the Genesis Kinds conference, I thought it would be a good idea to leave some time to see the Darwin exhibit at the Natural History Museum. I knew that most of our speakers would be very interested in the NHM (who wouldn't? ), and I suspected the Darwin exhibit would be well worth seeing. Photography was forbidden in the exhibit itself, but when the exhibit was at the American Museum of Natural History, a certain Colin Purrington took photos anyway and posted them over at Flickr. His pics give you a general sense of what the exhibit looked like. Darwin mania continues here at CORE! 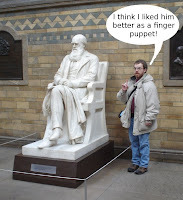 Well, maybe not, but I am about to post a string of Darwin-related items. Before I do that and fuel the rumors of my closeted evolution-ism, I wanted to clarify my overall thoughts about Darwin. Unlike 99% (or 99.99%) of creationism, I don't think Darwin is to blame for much of our present predicament. By "present predicament," I mean the widespread belief that the Bible does not contain valid or true information (except for some moral truth). I think it's a "predicament" because I do think that the Bible can be a source of reliable information, and I think that the church (and science and culture) suffers for failing to recognize that. I don't want to be too specific on how we suffer, because I'm not entirely sure how it manifests itself. I think society's been wrong so long that I have trouble imagining what being "right" would be like. Hmmmmm....... Mental illness? Maybe you should cut back on praising Darwin. Now we just have to do it again in July! For those interested in that conference, we'll have registration available hopefully by March. Meanwhile, remember the BSG call for abstracts, and you might want to order a copy of the book from Wipf and Stock (remember, if you're planning to come to the conference, you'll get a copy of the book with your registration). Today, we visited the Natural History Museum in part to see the Darwin exhibit, "Darwin's Big Idea." I have a lot of thoughts about that exhibit, and I'm going to put those in a separate post. Otherwise here's a few shots of our day. The main hall was crowded when we got there, but it was probably twice as crowded in the afternoon. Notice in the back where the statue of Sir Richard Owen used to preside over the museum he founded, now Darwin sits holding court. Owen would be ticked! One of these is an important historical artifact in the history of comparative anatomy. One is not. Choose wisely. For Friday, we scheduled a walking tour of Darwin sites in Cambridge. 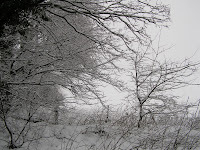 Then it snowed, and snowed, and snowed some more. Joe Francis and I loved every minute of it. It was like being home in Michigan, very invigorating. 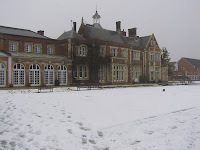 The snowball fight didn't come out so well (I can't aim very well - ask Kurt about it). Our first stop was the Boots pharmacy, where Darwin had rooms before he moved into Christ College. You can tell we were a bit chilly. We decided to spend most of our time inside, where it was not snowing so hard. Here we are at the Sedgwick Museum, looking at Devonian plants. This little shot I got at the Museum of Zoology. You know how rhino horns are made of keratin like hair? 'Tis true. The formal presentations concluded today, and I think we delivered a fairly good conference. I haven't talked to a lot of the people here, but they seemed to have enjoyed what we did. Here are some photos of the sessions. It's a chilly morning here at the High Leigh Conference Center, but we're off to an excellent start. Paul Garner opened our conference with a very interesting overview of the history of species and Christianity (even I learned some things). Ken Turner then followed with an interesting discussion of the Hebrew term min and its uses and misuses in the creation/evolution debate. Up next is Roger Sanders and his creationist take on island speciation. I'll be back later today with another update. It's a miracle! Despite all the nasty weather in London, we all made it to London on time and in one piece. Not only that, but it was a beautiful day in London. We stopped by Westminster Abbey for a photo (see below - click to enlarge), and then we spent some time at the Hunterian Museum. I really enjoyed the Hunterian, not just for the history but the design of the museum. They basically have the same eclectic collection as the Henning Museum but it looks much better. I got some good ideas for future renovations. Those who've read my Answers magazine articles or other work might have noticed that I frequently refer to the work of early creationists of the twentieth century, especially the Seventh-day Adventists Harold Clark, George McCready Price, and Frank Lewis Marsh. I familiarized myself with their works first through books, and later through their magazine articles. A few years back, I spent every Thursday for an entire semester at the library at Southern Adventist University going through their denominational magazines issue by issue, copying every article that had anything to do with creationism. That was a lot of work, but I think it paid off handsomely. Yes, I have a lot of less-than-helpful antievolution articles, but there are also some historically important gems, too.